The Outlaw Blues Band And The People brought the band a certain amount of acclaim, and they would score high-profile gigs playing with artists as diverse as Canned Heat, the Paul Butterfield Blues Band, Spirit, Taj Mahal, the Jefferson Airplane, and others. The truth is, however, that the album didn't sell especially well. The long delay between its recording and release (over a year) had found the band evolving towards an even more eclectic sound, while rifts caused by poor MANAGEMENT would change the band's musical chemistry as members left and new ones didn't quite fit in the same way. Remarkably, ABC/Bluesway Records requested a second record from the OBB, the label insisting on a much more blues-oriented set of material. 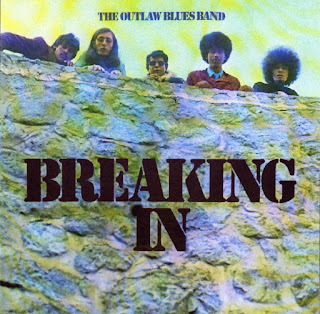 Recorded over a mere two days, by the time of its release a year later in 1969, Breaking In was supported by a band that included only Aleman and Whiteman from the original line-up. Still, since the band had cut its teeth on the blues, the performances on Breaking In are fresh, original, and masterful while still bringing the trademark OBB eclecticism to the material. New OBB bassist Lawrence "Slim" Dickens does a fine JOB of singing the Big Joe Turner soul-blues number "Plastic Man," his smoldering vocals laying smoothly atop a loping groove created by his walking bass line, Aleman's rhythmic beats, and Diaz's razor-sharp leads. A cover of the T-Bone Walker classic "Stormy Monday Blues" is equally spot-on, Dickens' soulful vocals complimented by Whiteman's jazzy vibes and mournful sax, Aleman's shuffling drumbeats, and Diaz's elegant fretwork. Dickens' original "My Baby's Left And Gone" is a straight-arrow blues tune and fine showcase for both Rubenhold's crying harp as well as Diaz's fluid guitar lines. The Latin-tinged "Mamo Pano Shhhh" is closer in spirit to the material on the band's first disc, the song a jazzy instrumental with Aleman's timbales and Colford's Congas riding high in the mix alongside Whiteman's dancing vibraharp tones. "You're The Only One" is a lofty R&B-styled ballad with a shuffling rhythm and slight, Latin-tinged percussion and vibes. It is easily the weakest track recorded by OBB, devoid of any real passion in Dickens' wan vocals, and only partially redeemed by the song's strong instrumental voice. On the other hand, "Deep Gully" stands as one of the band's masterworks, an instrumental jam that features one of Dickens' strongest bass performances, a mesmerizing underlying rhythm, Aleman's swaying percussive approach to the vibraharp, and Diaz's alternating sweet-and-spicy lead-and-rhythm-guitar. The song evinces a deep funky groove that seemingly rolls on forever, making it the perfect candidate for later sampling by the hip-hop legions. The band's lively and unique blend of blues, rock, jazz, and soul music was a decade or more ahead of its time, while its multi-racial make-up and deep well of influences place it on par with contemporaries like the Paul Butterfield Blues Band, Santana, Electric Flag, and the Allman Brothers Band. Sadly, these albums have been lost for decades, but are ripe for re-discovery by adventuresome blues and jazz fans.